" " wisno wood furniture finishing: How to check the stain color. How to check the stain color. Checking the stain color is one very important thing in finishing process. Every stain is needed to be checked before it is applied. The color of the stain is usually checked according to the standard to ensure that it is correct. Checking stain is very important to prevent the risk to get problem caused by the incorrect stain. The fact is the color problem in the finishing process mostly is caused by the stain problem. On a finishing industry with large production scale, the stain is needed to be checked daily in the fist time when the finishing process is started. Every stain should be checked before being taken to the finishing room and be used in the finishing process. The stain color can be viewed and checked by compare its color with a standard stain. When we made a step panel for certain finishing color and appearance at the same time we have to save every stain that we use to do the finishing process. The stains used in making step panel are used as standard to check the stains that we will be used for the finishing process in the production line. In the finishing material manufacturer, the stain is checked by special machine to check color (colorimeter), but in the finishing industry, the stain is usually checked by manually observation. There some tools to make the stain color observation can be easier done, the pour down card, ceramics and piece of wood or veneer. Here are some methods and tools to check the stain. Checking stain color by using pour down cards, ceramic or glass. 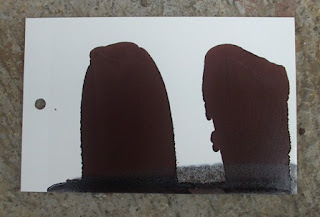 Pour down card is a card or paper that is made specifically used to view the stain color. Stain is poured on the card, then its color can be viewed. To checking according to the standard, the stain and the stain standard both are poured on the card side by side, and then we can view and compare both color easily. 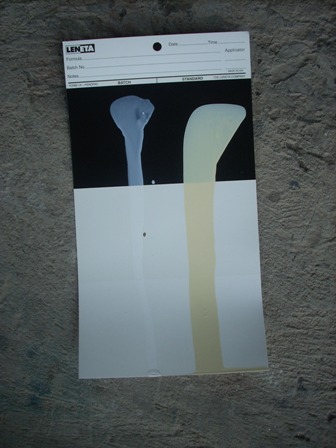 There are several types pour down card, the white paper is used to view any color stain instead of white color stain. The black paper is used to check and view the white color stain. Pour down this card is very helpful to check the color of the stain. When we mix the stain, every time we add some color or pigment in the mixture we usually need to check the stain color resulted until we get the right color. Pour down card can only be used once, and it can be kept as a document of stain color. But since that we may need to provide the card in big amount. In a big volume finishing industry, we may need to check the stain color many times every day and it may consume lot amount of pour down card. The other tool that can be used to check the stain color is ceramic or glass. The ceramic is work as the pour down card. The stain is poured on the ceramic and viewed its color. The black ceramic is used to check the white color stain, while the white ceramic is used to check the stain in other color. Ceramics can used many times since it can be washed and cleaned easily with thinner and can be used again. But ceramics can not be used as a document to record the stain color as the card. Glass is almost the same with the ceramic, but it more clear and no color. It may not work as good as the ceramic. Checking with a piece of wood or veneer. Another tool that can be used to check the color stain is a piece of wood or veneer. Small pieces of wood or veneer can be used as a tool to help see the color stain, such as pour down cards or tiles. The stain is poured down on to the wood surface and viewed the results. To be more visible, then the poured stain can be coated with a clear coating. Sealer or top coat is layered over the stain will make its color more visible and easily viewed. Pouring he stain in a piece of wood or veneer can be closer to the actual finishing process, but sometimes the veneer or wood condition can influence the results. It make the color may as not as visible as the uses of ceramic or pour down card. We can also spray the stain on the wood or veneer to check the color. The stain is sprayed on the wood and coated with clear coating then it can be viewed to see its color, but since the variation of spraying result this method cannot be used to compared the color of two stain. No matter how well we spray, it will be very difficult to do the same operation spray in different time. pak, kadang retain yg kita pakai koq ga bisa sama pada proses prod selanjutnya ya?? kenapa ya? Ya, karena itulah maka kita perlu mengecek stain setiap kali akan menggunakannya. Warna stain bisa berubah karena beberapa sebab, misalnya karena: kualitas campuran, penguapan thinnernya, karena tercampur dengan bahan lain, kalau stain dibuat sendiri bisa juga karena campurannya yang tidak tepat,dll.